Alternatively I could just stick a lump of crusty bread on the hook and hope. We shall see. Also maggots! 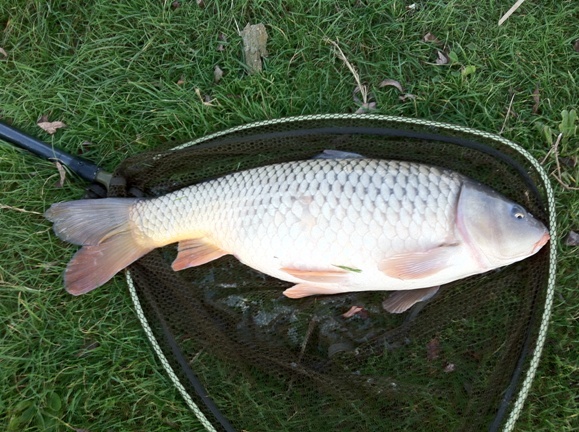 (yuk) are apparently favoured by carp in the cooler weather. I think I’ll try the bread. Meanwhile it looks like the smelly mix is still working for the ledger rod – I tend to use a small feeder packed with a mix of marine halibut with a 3″ hair rig holding a 8mm pellet (the same bait but more solid). The fish practically catch themselves on this rig so I wonder if it’s cheating a little. Meanwhile I was out again the other weekend although my usual fishing buddy Andy didn’t come. It was pretty quiet until I switched swim. It’s weird – I began fishing about 15 ft to the left of where I’d been and started getting lots of action. As usual nothing massive but this fed-up looking 3 1/2 to 4 pounder was the best of several similar sized common and mirror. It was pretty quiet out there but at least I had Val the water vole to keep me company. Here he/she is taking a dip.